For this latest Product Developer Index, the company surveyed 1,190 members of the 1.3 million strong Hackster.io and element14 engineering communities to understand where they are focusing their development efforts, what the challenges are, and what has changed over the past year. According to 61 percent of respondents, IoT and sensors are the most important technologies for products they’re designing today. IoT products saw the most significant growth in importance, up 14 percent from last year, followed closely by drones and robotics projects, which were up 8 percent. 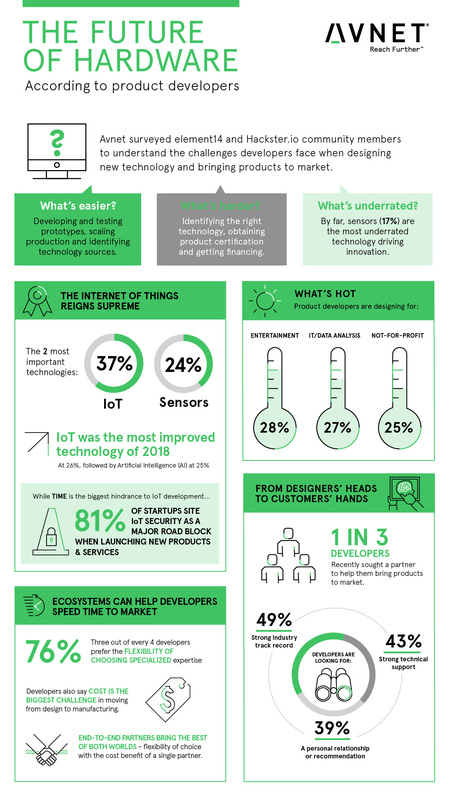 More than a quarter of developers (26 percent) also note that IoT is the most improved technology of 2018, followed closely by artificial intelligence (AI) at 25 percent. Despite the robust growth of innovation last year, developers are facing greater challenges in certain areas, the research revealed. According to respondents, the most difficult elements of product development are identifying the best technology to use in their designs (26 percent), as well as obtaining product certification (22 percent). The most challenging aspect of bringing products to market is obtaining financing for development (34 percent). Developers believe that security remains the biggest technological hurdle in IoT deployment (81 percent). Time is the greatest hindrance, respondents say overwhelmingly. They also say that cost is the biggest challenge in moving from design to manufacturing. However, developers saw some improvements over the past year. When asked what phase of product development has become easier, 58 percent pointed to developing and testing prototypes, which is up 17 percent from the year prior. Developers also found improvements in the process of identifying the best source for technologies (up 9 percent) and scaling production (up 16 percent). The survey also revealed interesting trends toward finding new partnerships and collaborations for development. More than a third (37 percent) of developers have sought a partner to help them bring a product to market. When looking for that potential partner, several qualities stand out. Developers said that they lean toward those who have a strong track record in their industry (49 percent), can offer strong technical support (43 percent), or are a result of a personal relationship or recommendation (39 percent). An overwhelming majority of developers (76 percent) prefer having the flexibility to select and choose vendors based on market needs and expertise.